After a month of aerating the homemade fish emulsion mixture to help decompose it, the emulsion is now ready to be extracted and collected. Although there is still some fish and molasses odor, the terrible stink of rotting fish is now mostly gone. The process to extract and collect the homemade fish emulsion concentrate is a bit more involved than the every other day aeration of the mixture in the past month. 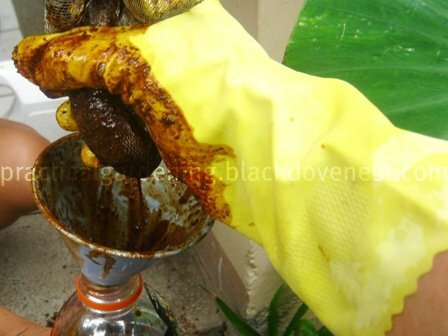 You may need a partner to help you in filtering out the undecomposed fish parts and sawdust from the liquefied fish emulsion. To extract the fish emulsion, you need to separate the liquid part from the solids in the mixture. The solids include sawdust and the still undecomposed parts of the fish like scales, bones, tail, fins and head. The procedure outlined below is labor intensive and will take you 1 hour to extract the fish emulsion and collect it in the plastic bottles. For safety purposes, wear rubber gloves. Choose gloves that are long and have a thicker lining. You will be handling partially decomposed or undecomposed fish parts and bones that may be sharp and pointed. Wear other safety apparel as needed. Window Screen, 10" x 10" - 1 pc. Plastic Bottles with caps - 2 pcs. Position the basin near the 5-gallon bucket containing the fish emulsion mixture as shown below. To pre-extract, remove as much of the solids as possible in the mixture. With your hand, scoop up a mush from the bucket. Wear rubber gloves as you do this. Squeeze the mush in your hand and let the liquid drip or trickle down inside the bucket. Shown below is the pulp that is left after squeezing the mush. Put the pulp (squeezed out mush) into the basin. 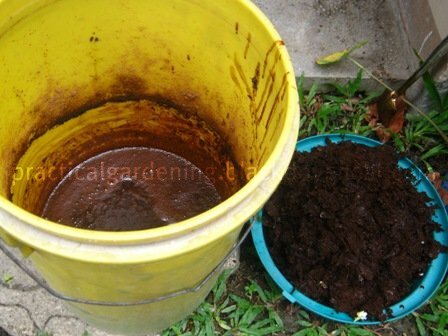 Continue the previous 3 steps until you are left with a slurry inside the bucket that is almost all liquid. 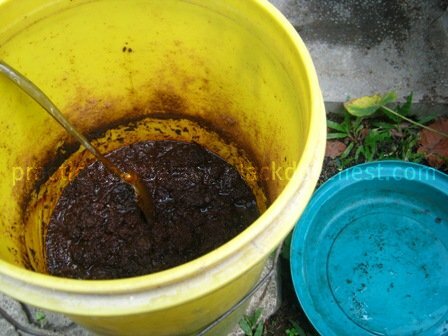 Notice the pulp has been piled in the basin at the right and the level of the mixture inside the bucket has gone down. 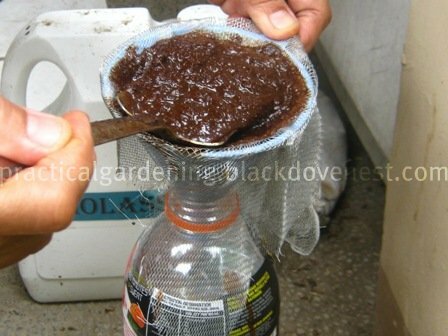 For the extraction part, prepare the filter by positioning a funnel in one of the bottles and then lining the window screen piece inside the funnel. 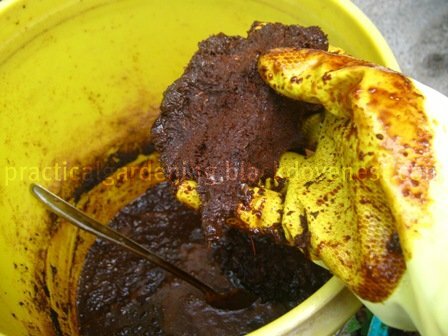 Using a dipper or ladle, scoop up a little of the slurry and pour into the filter as shown below. Let the liquid part of the slurry drip down into the funnel and inside the bottle. When no more liquid is dripping, lift the window screen containing the slurry, by the edges, with the left hand. Still holding the window screen with the left hand, squeeze the slurry with the right hand as shown below. The squeezing is akin to wringing out water from a face towel. Let the squeezed out liquid drip into the funnel and inside the bottle. As in the pre-extraction process, put the pulp in the basin. Fill as much plastic bottles as you can with extracted fish emulsion liquid. Ensure the now-filled up bottles are tightly capped. With a pair of scissors, cut the old labels of the bottles and remove the old labels. 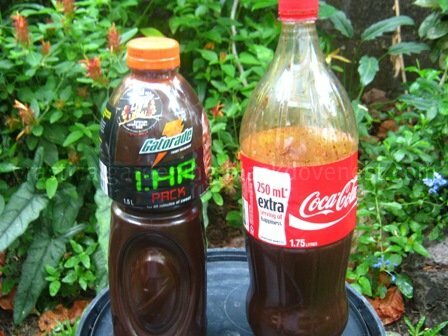 Clean the outside of the bottles by washing them with soap and water. With a rag, wipe them dry. With the new labels, masking tapes and scissors, relabel the bottles of fish emulsion concentrate accordingly. 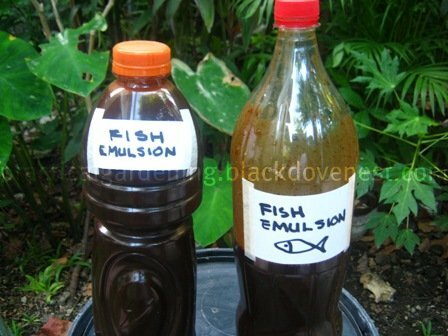 The above are the finished products of the homemade fish emulsion fertilizer DIY project. The liquid emulsion is highly concentrated and should not be used as is, directly to your garden plants. Dilute to apply the homemade fish emulsion as fertilizer. Fantastic work. Great description and guide. Fail proof. Love it. Did you throw away the pulp afterwards? Can't it be applied to the soil as dry compost? Tnx for dropping by, Karina. You can use it as a starter mix for the next batch of fish emulsion, if you wish to do another one. Sure, you may apply it to the soil too. It's concentrated, not that it will damage your plants, but you could dilute it too so it can use it longer. Is the sawdust only used to keep the smell down? What happens if you don't use it? Can any fish be used? I'm thinking of using the local Asian Carp all cut up. What are the nutrients that come of this besides the nitrogen? Tnx for stopping by, Cherish. Yes, the sawdust keeps the smell down. You can also use crushed dried leaves, although mixing may be a challenge. Any fish can be used. I try to be economical and ask for any fish scrap or waste. Other nutrients include carbon from the 'greens' (sawdust/leaves) and other trace elements. I also add Epsom Salt (Magnesium sulfate) for magnesium. Wow great idea. How much epson salt and magnesium? I live near fish production plants along the gulf coast. Thanx Skip. In my case, I add up to 1 tablespoon of epsom salt per gallon in my watering can. My mulberry tree responds very well in fruiting with the addition of the epsom salt. Epsom salt already has magnesium in it. Thanks for your info, is there any has building up when the bottles are stored . Takitaki, if you mean pressure build-up, I've not noticed any, although I don't fill-up up the space inside completely. I typically leave a few inches of air inside the bottle. If, however, you will feel the plastic bottle becoming hard to the touch (pressure buildup), then you might need to slowly open the cap a little to let out pressure and then re-cap again.